For the food lovers, which want to be health cautious, Chinese recipes may prove to be the best option for them, both taste and health wise, advices executive Chef of Hotel Niyaaz Pranesh Nag. Speaking to AAB, Pranesh shared his views, stating that many are unaware of what exactly the Chinese dishes of Indian kitchen are. There are many vendors or hoteliers which sell so called Chinese dish `Chicken 65′, in which chicken pieces are coated with Tandoori paste and are fried. Tandoori masala is North Indian and has nothing to do with Chinese recipes, he clarified. 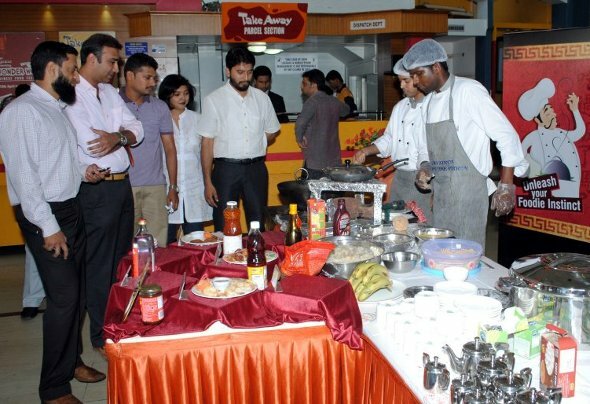 Under the Chef’s guidance a Chinese food festival has been organised named “Wonder Wok” at Hotel Niyaaz opp. CBT Belgaum. A special hall has been reserved for this fest and one could try eating the noodles with the Chop sticks as well. The food fest will be open from 19th April to 3rd May 2012 from 11 to 4pm and 7 to 11pm. 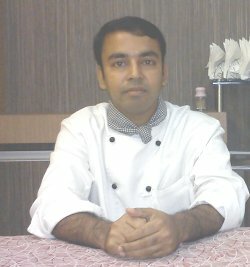 Hotel Private Limited of Belgaum for acquiring his first experience in the busy moving `Food World’. customer requires,’. Where as cooking can be defined as perfect combination of art and technology done by the chef, he added. Pranesh focused on the importance of food policy and education, cookery, hospitality, innovation, product development (research) and more, in hotel business. here are negligent about maintaining cleanliness, after they step out of their houses. The chef, who has recently migrated from Goa to Belgaum, said, `Belgaum is a wonderful place, with fascinating climate and loving people. The only thing felt negative is that many of the people throw garbage or spit anywhere, when they are out of their houses. He said that though City Corporation is responsible for maintaining the hygiene atmosphere of the city, it is also the duty of every citizen to cooperate it for doing so. pure authentic Chinese food will never suit the taste buds of our people …. a bit of Indianazation is required for the people to accept it…. food is always a local issue ….. n should b prepared keeping the local people in view …. I have eaten authentic Chinese food in Australia, Malayasia & Spain; I bet its very difficult to eat for the first time. Most of the resturants & road side eateries do serve so called Chinese food; these are definitely tasty but not the authentic Chinese but a fusion of local stuff. My only wish is people should not be taken for a ride instead educate them; I guess the restaurant in Belgaum will do that. The names of indian chinese dishes are not at all known in china. some ingredients like soy sauce, vinegar, chilli paste, green chillies may be common. I am no expert in chinese cooking, but based on my exposure to international cooking, basic style of chinese cooking is either stir fry or steamed. Sticky rice is integral part of food. Dimsum is also popular, which is essentially a rice cake stuffed with variety of stuffing like meats and veggies. Mainly they eat beef and pork, also chicken. All body parts you can imagine are eaten. yes, including chicken feet, pork toungue, testicles, brain, tail, etc etc. This part of their food is not for squeamish. Just remember that item chicken chowmein, or manchurian, just another style of indian cooking. not available in china. being a real foodie..i took my interest to get a taste of this chinese food fest…to add on to it,im also a chinese origin..however,to my dissapointment,the food was simply utter horrible! !to be real honest,it was by far the worst experience n food i ever had! !there is room to improve..so please buck up..
Not to take away any credit from anybody… I still feel unjustified talking about food dishes as if it were some satellite launch. Why make fuss? If the food is hygienic and edible then eat it and get on with it. Good to know about this. Although I am not a big fan of authentic chinese food, it’ll be a nice experience to check out what is on display. All the same it should be a good experience.